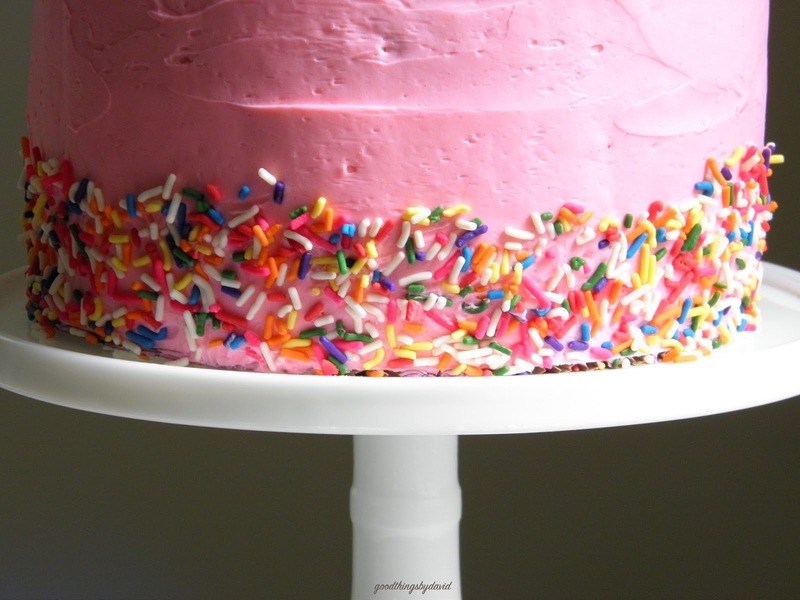 Cheerful, bright, colorful and immeasurably edible, are just some of the ways to describe a sprinkles birthday cake. That is exactly the type of cake I baked for a dear neighbor's daughter over the weekend, and I did all of it in a matter of hours. 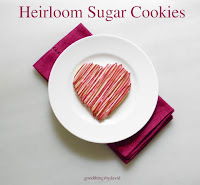 It's almost a foolproof cake that is bound to appeal to kids and adults alike if you use the best ingredients, and if you cover the cake in Swiss meringue buttercream. 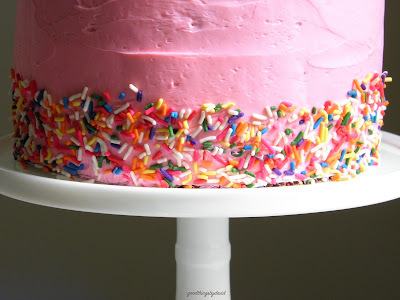 I've seen sprinkles cakes vary in the amount of jimmies used for decorating, from some being completely covered to others being lightly sprinkled. For this sweet birthday cake, I decided to sprinkle only the bottom third of the double layer cake. 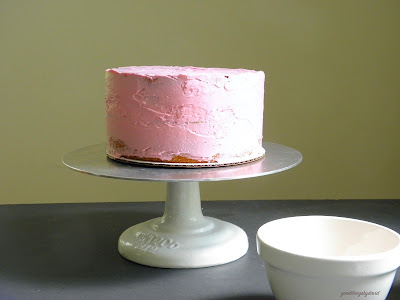 After baking two 8" round yellow cakes (the 1-2-3-4 cake never disappoints) and letting them cool, I made one batch of Swiss meringue buttercream, and tinted it a very light, electric pink. Once that was done, I secured a cardboard cake round in the center of my decorator's turntable and placed the first cake layer right side up. To this, I spread a small amount of the buttercream on the top of the layer, and then I carefully placed the other 8" round cake layer over that, bottom side up. The entire cake was given a crumb coat of Swiss meringue buttercream, which was then chilled for about 15 minutes. It was then a matter of applying the rest of the buttercream to the cake, taking care to even out the sides of the cake. 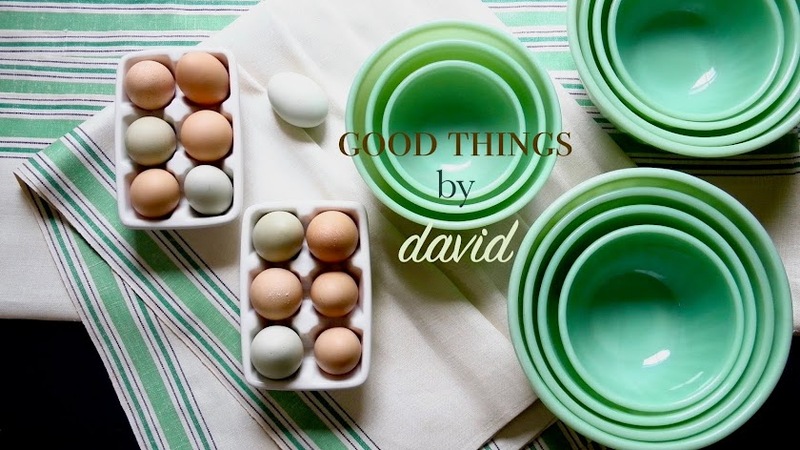 A bowl of sprinkles, a spoon and my decorator's turntable set over a rimmed baking sheet was all that was needed to finish it. I gently spooned the sprinkles around the bottom third of the cake, making sure that they adhered to the icing. It helps to rotate the cake turntable as you do this. 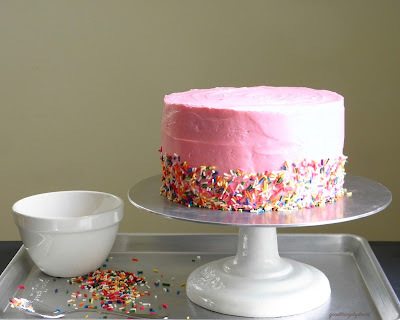 Any excess sprinkles can be transferred onto the baking sheet. Voila! There is nothing like tasty, delicious Swiss meringue buttercream on a cake. 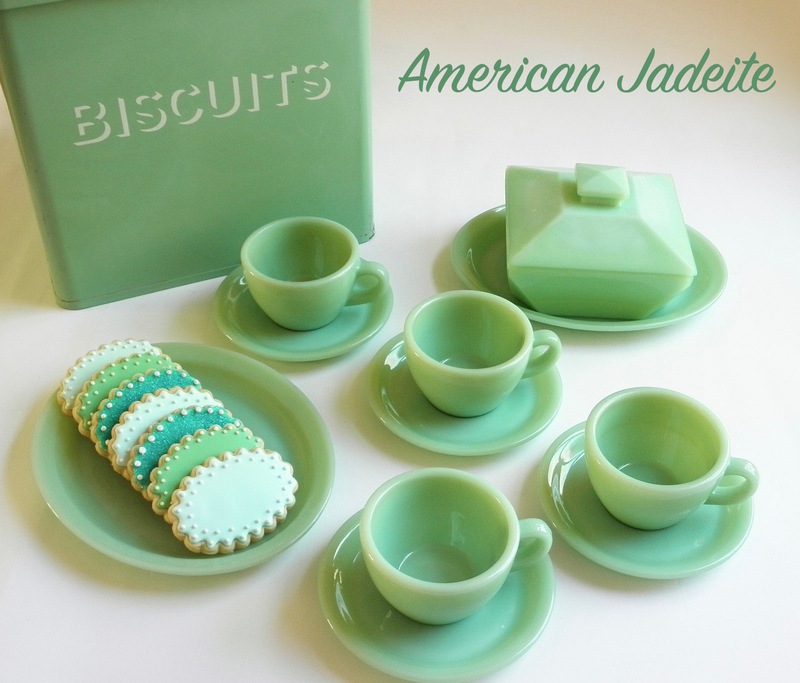 With the addition of the sprinkles, it makes the dessert even better. 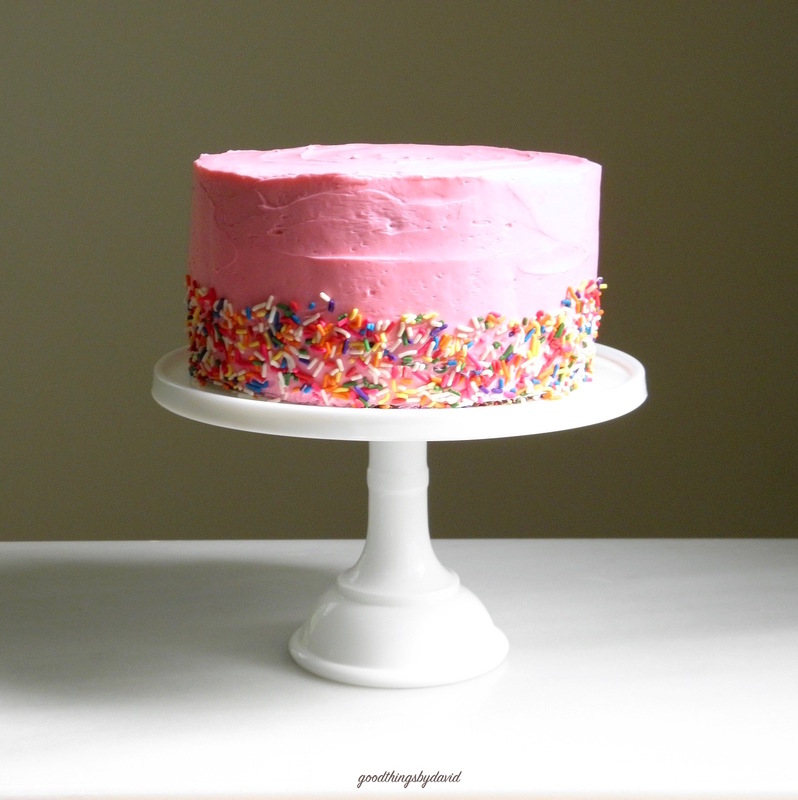 Click here for a full tutorial and recipe for Swiss meringue buttercream. There you have it. Easy as 1-2-3. 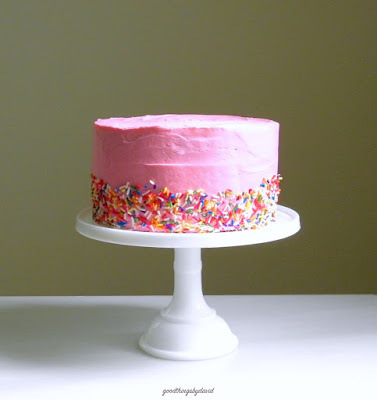 Make a sprinkles cake for a special individual in your life and watch them smile upon taking their first bite.